A burnt-tip orchid (Neotinea ustulata) photographed in Estonia. Credit: Kadri Tali. Scores of plant species are capable of living dormant under the soil for up to 20 years, enabling them to survive through difficult times, a new study has found. An international team of academics has found that at least 114 plant species from 24 different plant families, from widespread locations and ecological communities around the world, are capable of prolonged dormancy as adult plants, remaining alive in the soil but not emerging from the ground every spring. This behaviour enables them not only to survive through difficult times, but to make the best of adversity. 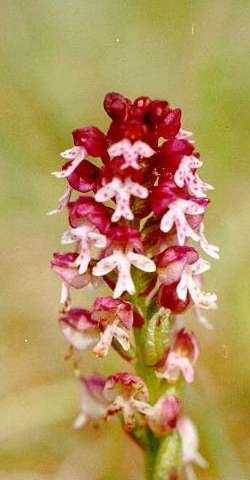 The extraordinary behaviour is seen in many species of orchid, and is reminiscent of the fictional character Rip Van Winkle, who sleeps for 20 years and misses the American Revolution. It also occurs in many other types of plant. In an article published in Ecology Letters, scientists reveal that dormancy is often a "bet hedging" strategy for the plants, with the short-term disadvantages of missing growth and reproduction in one or more seasons being outweighed by the longer-term benefits of avoiding immediate risks and thereby extending their lives. Dormancy occurs only in some of the plants in any population or species in any given year, and is dependent on individual circumstances. Co-author Prof Michael Hutchings, Emeritus Professor in Ecology at the University of Sussex, said: "It would seem to be paradoxical that plants would evolve this behaviour because being underground means they cannot photosynthesise, flower or reproduce. And yet this study has shown that many plants in a large number of species frequently exhibit prolonged dormancy. Many of these species have found ways to overcome the loss of opportunities to photosynthesise during dormancy, especially by evolving mechanisms enabling them to obtain carbohydrates and nutrients from soil-based fungal associates. This allows them to survive and even thrive during dormant periods. 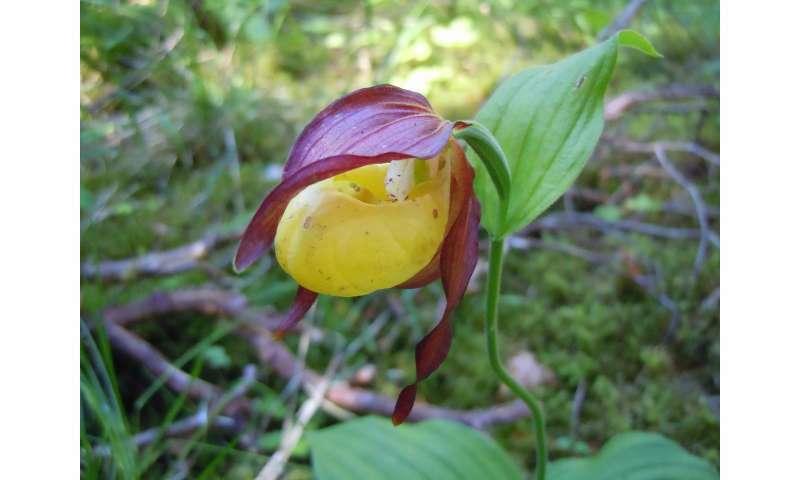 A lady's slipper orchid (Cypripedium calceolus) photographed in Estonia. Credit: Richard Shefferson. "The study has revealed some of the conditions under which dormancy is triggered, and the evolutionary benefits of such behaviour, but more work is still needed to fully explain the influences of factors such as weather conditions, and the threats from herbivores and competition from other vegetation, on the decision to go dormant." Dormancy in seeds has been widely known about and studied for decades but the phenomenon of dormancy within plants that have left the seed stage behind and embarked upon adult life is far less well-known and understood. The study, led by University of Tokyo associate professor Richard Shefferson, is the first detailed analysis of the causes, ecological functions and evolutionary significance of adult plant dormancy, using data from a large number of datasets and published studies in which the behaviour has been recorded. Reasons for plants entering a period of dormancy differ both between species and even between populations of the same species in different geographical locations. They include the risk that buds and new shoots will be lost to herbivores, the occurrence of a poor growing season which prevents the build-up of sufficient resources to produce sprouts in the following year, and, in an increasingly warming world, winters that are so mild that plants do not perceive that spring has arrived. Moreover, although the research team hypothesized that dormancy would be more prevalent at colder latitudes and higher altitudes, where the growing season is shorter, it was shown to be more common near the equator, where threats from factors such as disease, competition, herbivores and fire are more severe. Co-author Dr Eric Menges of Archbold Biological Station in Florida, USA, said: "In fire-prone areas, there appears to be an advantage to plants remaining dormant and then sprouting after fire when favourable conditions exist for growth and flowering". Prof Hutchings added: "Phylogenetic analyses also revealed that dormancy has evolved and persisted numerous times throughout the evolutionary history of the land plants. This suggests not only that it has proved beneficial under many different ecological circumstances, but also that its evolution may be achievable through the occurrence of a small number of mutations at only a few genetic loci."